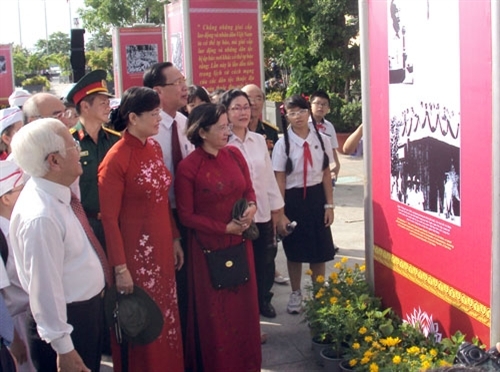 HCM City — HCM City's Overseas Vietnamese Committee yesterday organised a meeting with 100 representatives of the Viet kieu community to mark the 70th Independence Day, September 2. "Overseas Vietnamese have significantly contributed to the cause of national construction and defence, and been an important element in consolidating co-operation and friendship between Viet Nam and other countries," Le Thanh Liem, deputy chairman of the city People's Committee delivered, told the meeting. Since 2004 overseas Vietnamese have sent remittances of US$40 billion, accounting for 40 – 60 per cent of the country's total. The figure was $5 billion last year. Several millions of dollars have also been raised for charity by overseas Vietnamese. Hundreds of experts have returned home, bringing science and technology to serve the country. At the meeting, the committee awarded the Labour Medal, third class, to Prof Dr Dang Luong Mo, a Japanese-Vietnamese who is an advisor to the National University HCM City, for his contributions to setting up the semi-conductor industry in Viet Nam. "I was very lucky to witness the revolution on August 19, 1945, and heard the Declaration of Independence by President Ho Chi Minh at Ba Dinh Square, and at that time, though I was a little boy, I was aware of the significant change in Viet Nam's destiny," Mo said. "We wished to contribute more to create a strong Viet Nam." The committee also awarded the Primer Minister's merit certificate to Prof Dr Vo Van Toi, head of the microbiology faculty at the National University – HCM City International University. "The Government and local authorities should realise that overseas Vietnamese experts sacrifice their life, future, income and development to return home," Toi said. "Therefore, [they] should offer special incentives for overseas experts and attract overseas students coming back after finishing their study."